Thank you to all who attended this training event - you had to absorb a lot; time now for implementation. Best of luck to all of you! Don't forget to visit the link to the How-To Videos! Thank you to the Organizers of the Event: AEM Mortgage, Sihle Insurance Group, and Broker Agent 360. Tickets: $199 - limited to 100 Participants. All tickets include lunch and all training handouts. 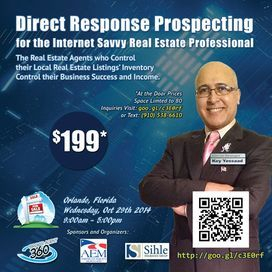 About the Training: One of the biggest areas of opportunity that many agents have yet to master consistently is Direct Response Prospecting in Real Estate. It is a Strategy that goes beyond focusing on Buyers’ Leads – it is a Strategy to create an incubation system to generate listings methodically, then use those listings to generate more listings. Technically speaking, Real Estate Professionals must become proficient with Inbound Marketing, Proper Listing Blog Marketing, Squeeze Page Building, and YouTube Video Marketing for Reverse Marketing. All of these ideas need to be controlled and focused with a proper SEO Strategy focused on Google and Search Engine Visibility! 4:00pm - 5:00pm: Social Media Prospecting Postings, and Video Blogs. 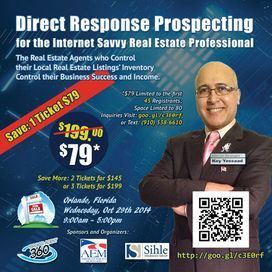 Key Yessaad is a Real Estate Internet Strategist, SEO Trainer, and currently co-Trainer of the i-FAStTRAC Real Estate Training Program - LiveInteractiveTraining.com. Mr. Yessaad has been a Trainer and Business Coach for the past 10 years focusing especially on empowering Agents develop the Skills and Habits of Web Services, SEO Strategies, Blogging, Internet Marketing, and Listing Success. The enclosed files and videos are for the personal use of the training participants attending today's Workshop. These files may not be shared, copied, reproduced, or used at any other event or gathering without the expressed permission of the Real Estate Web Trainer, LLC. and of Key Yessaad. Unauthorized duplication of this program, book, handout, outline are illegal under international copyright laws. No part of this program may be reproduced, transmitted, transcribed, stored in a retrieval system or translated into another language in any form, by any means, without the written permission of the Real Estate Web Trainer, LLC. and of Key Yessaad. ©1988-2013 Real Estate Web Trainer, LLC.